I can’t imagine a place that could be more overwhelming. Once again, this wasn’t necessarily the plan, but I had a chance to meet up with my friends Adam and Aislinn, who are also traveling around the world (but in the opposite direction). It seemed like too good an opportunity to miss, so without hesitation, I booked a flight from Kathmandu down to Varanasi. Initially it all seemed quite easy. My Air India flight landed in the midst of spacious green farmland, and I deplaned into what seemed like a brand new, almost empty terminal. Then the confusion began. No one had handed out immigration forms on the plane, so an Indian official started handing them out as we approached the baggage claim area. People started filling them out at the desks of the customs officials, which then kind of turned into lines. It seemed like there were three lines, but no, just two, one of which required going to the third desk after the second. A few Indian people pushed there way to the front, but most formed a neat queue. The worst were the older Western tourists, who just kind of milled about, forcing their way into one line, then the next. Eventually I got out of the terminal and hired a pre-pay taxi, which I think is legit, but the price still seemed to match too-neatly the amount of money I had just changed next door, and it was a bit hard to follow who got the payment. The ride into town was quite peaceful, at least for the first twenty minutes or so. As we got closer into the town, everything started to fill in, with the number of people increasing exponentially as we drew near the centre. 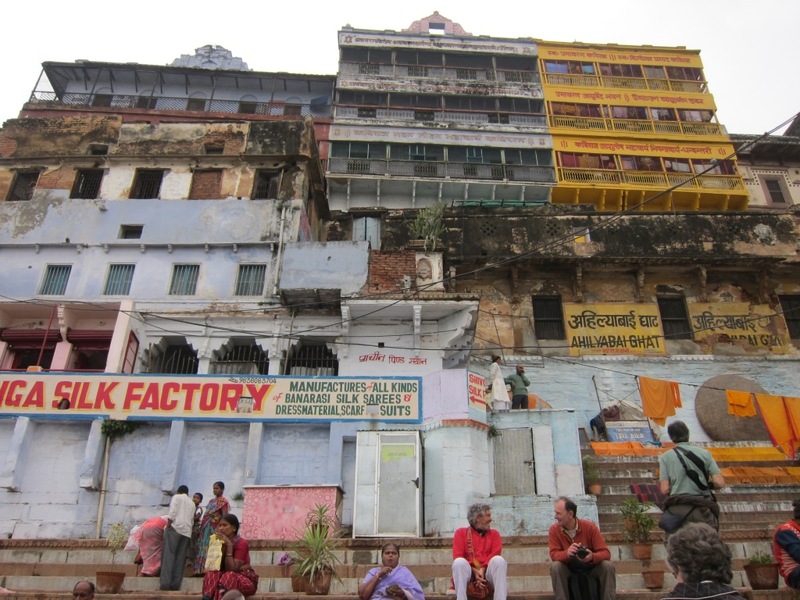 To be honest, there were so many kinds of crazy overlapping in Varanasi, I can’t even begin to tell you what’s what. I do know this, however. 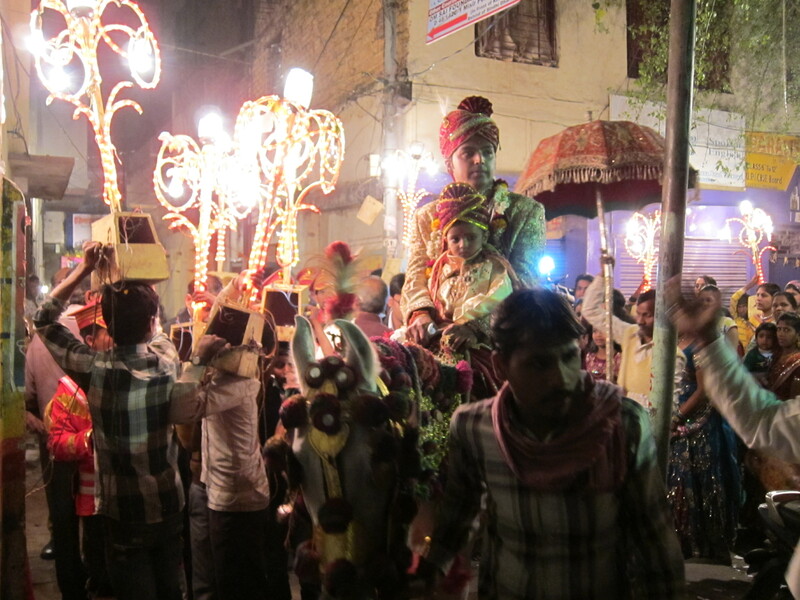 It’s the middle of the Kumbh Mela, (more on that later), and it’s wedding season. The driver had warned me before we left the airport (though after I had relinquished my rupees) that he wouldn’t be able to get me all the way to my guesthouse because of police barricades, but he actually did a pretty amazing job of using all the back channels and alleyways to get me as close as he could. Anticipating this eventuality, and not wanting to be taken to a different guesthouse. I had carefully followed our route on my map (torn out of my Lonely Planet in a moment of haste! ), and was 90… 80… well, quite confident that I knew where I was, where I was going, and how to get there. 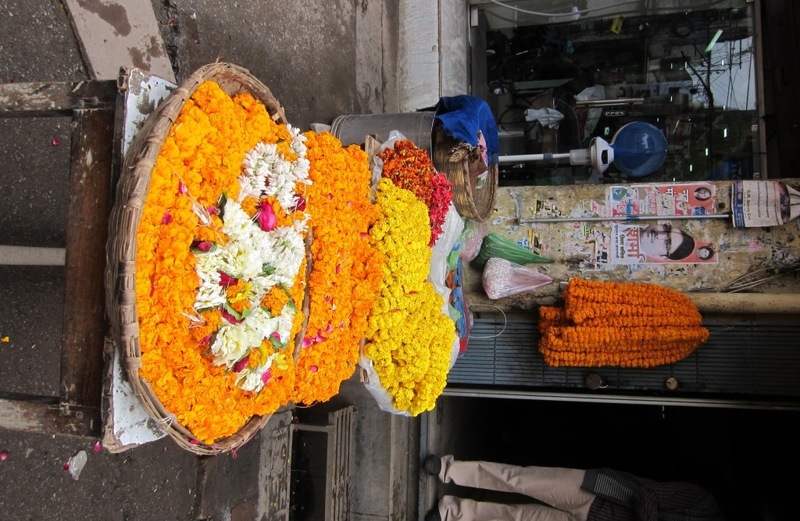 Throwing on my backpack, and ignoring the waiting rickshaws, I set out on foot. Varanasi is known for many things. One is for being very spiritual. Another is for being very intense. I can no longer quote the sentence in full unfortunately (see above), but my guidebook proclaims “it’s not for the faint of heart”. Fortune was with me, however, and I was able to make it to the guest house without incident. (It turns out that traveling during a time of peak domestic tourism can be a huge advantage, as most of the hustle is aimed at a different target). By this time is was hours later than I had expected to arrive, and Adam and Aislinn had already waited for a while, gone out, left a note, and come back again. Fortunately none of us had eaten, so we decided to go in search food. Having already been in India for some time, my two friends were eager to track down a well-regarded pizza restaurant on the banks of the Ganges, and I was in no position to argue. The walk home was completely different, however.Varanasi is situated on the banks of the Ganges, and it’s notorious for being a place where all aspects of life are lived completely out in the open, from birth to death, and everything in between. Although I gather that the buildings are all relatively recent, the place has been important for centuries, and it has the feel of an ancient city. 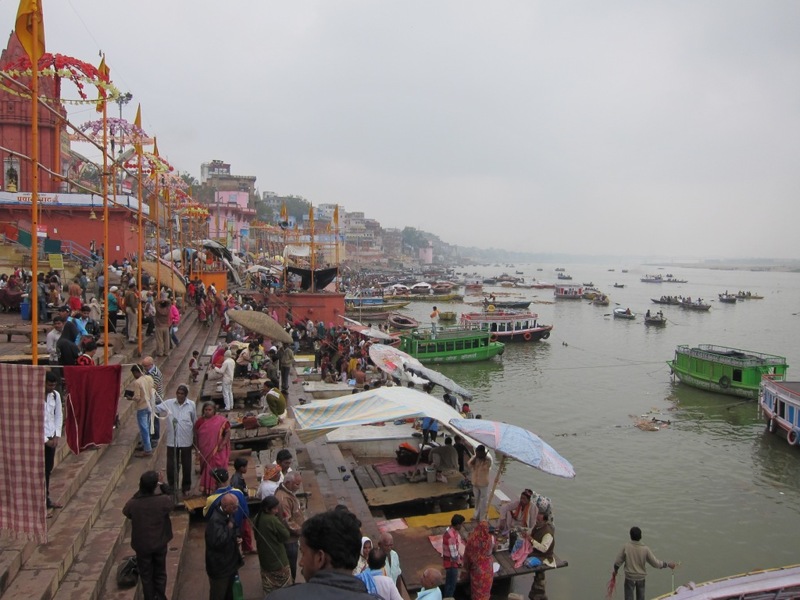 Above all, Varanasi is famous for its Ghats – long staircases leading from street level down to the water. They are all mostly connected along the riverbank, and during the day they are full of tourists, hawkers, and children playing cricket or badminton. At night, however, we found them eerily quiet and empty. Most ghats are used for the purpose of washing or bathing. A few, on the other hand, have been established as “burning ghats” where cremations take place. Walking back from dinner, we came across two funeral pyres burning by the water. We watched from a distance, and it was a bit hard to tell what was happening, but we eventually saw the bodies being carried down the steps, which were bathed in the river before being burned. 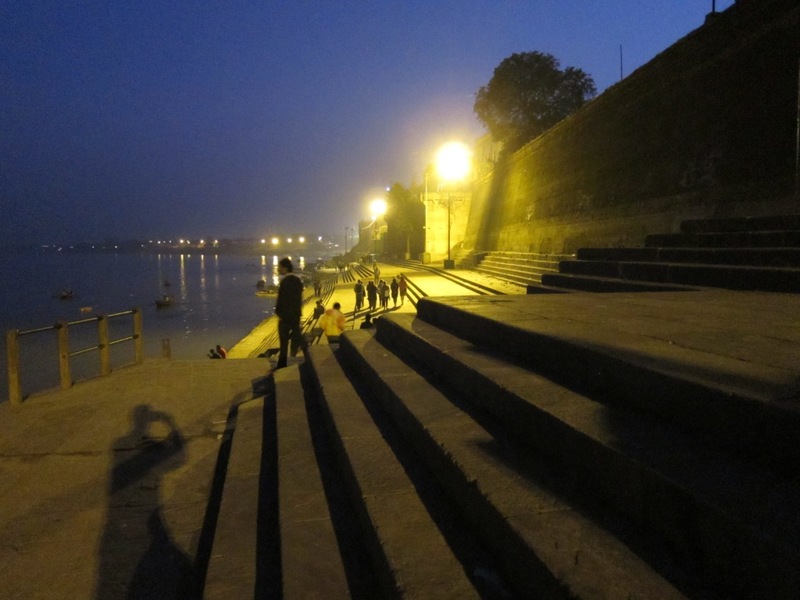 The Ghats were quiet, but on the far side of the river, fireworks could be seen from an unrelated celebration. Back on street level, the parties continued until late into the night. On the first night, it was weddings. 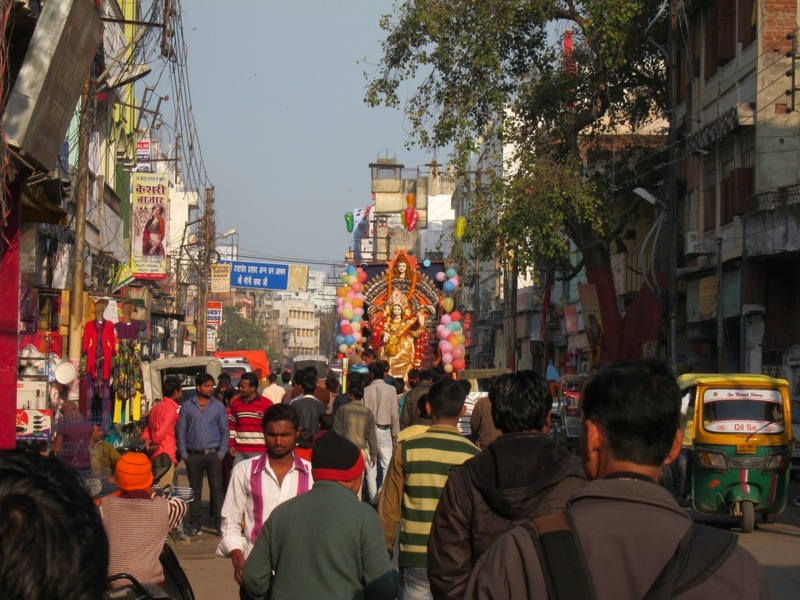 On a subsequent night, people carried large statues of what I later learned was the Goddess of education down and into the Ganges. Everything was very colourful, and somehow involved roving dance parties, with huge crowds of mostly young men seriously cutting loose behind giant mobile speaker platforms. 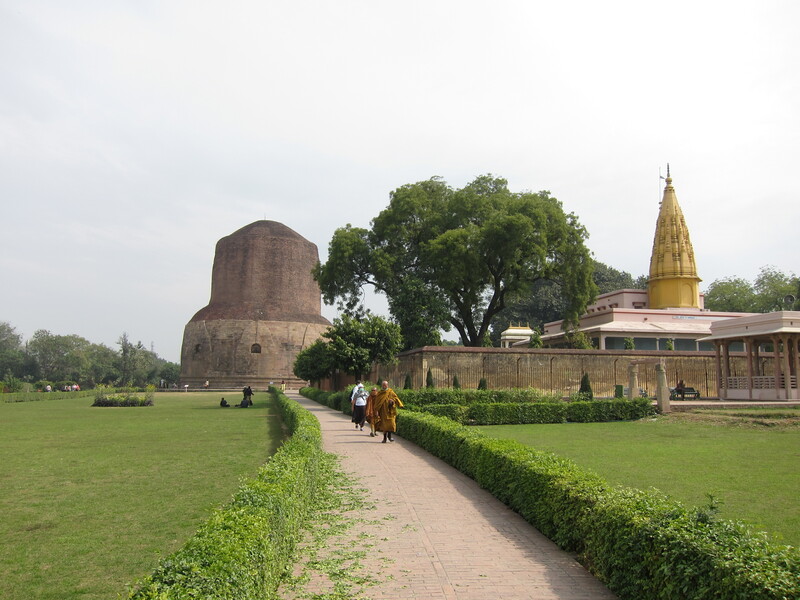 On the second day, Adam, Aislinn and I took a day trip out to Sarnath, where the Buddha is said to have first preached the Four Noble Truths and gained followers. It was a very peaceful reprieve from the city, and we were all impressed by the giant Buddha statue. In addition to being an engineer and a doctor, Adam also conveniently holds a degree in religious studies, and was able to provide an amazing amount of historical context and interpretation of the various monuments, symbols, and practices we observed, both in Sarnath and Varanasi. Hi Dallas – I was able to hear the audio fine. Cool! – Jeff. Amazing Dallas; and yes I can play the audio clip on Susan’s MacBook Air; after selecting the downloaded file it brings up VLC Media player and plays fine. I may have downloaded this player at some point but if so it’s free. This post and the next remind me of the many things I have read while practicing TM and learning a little about the Hindu Traditions from Maharishi Mahesh Yogi . audio plays fine. and is a great idea for a different way to capture travels. i’m adding field recordings into my next trip abroad. thanks. Thanks for the continued comments everyone! I’m glad that the audio is working. There will be more to come! Just fantastic to read these descriptions and getting a sense both of your environment and how you are experiencing it.